Improved UX Design for JuanTax Portal, 2303 Notifications, OTP and Gmail Login. We believe that there is still more than just having your business being shown within the system, and it’s not enough to just view and delete organizations -- what we wanted is to have a portal that serves as your one-stop location in not just viewing, but also in organizing your company inside JuanTax. Which is why we are proud to announce the launch of our new JuanTax organization portal. The new JuanTax portal has categories which refines the search of organizations within your account, and aside from the default categories, you can also customize your categories inside JuanTax -- making it easier to look for the organization that you want to manage. Be able to learn more about our new JuanTax portal by visiting this article. 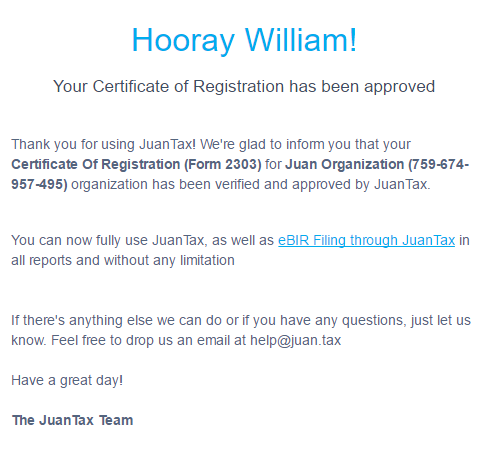 Notifications will now be sent via email once you have verified your 2303 form (Certificate of Registration) in JuanTax. Once you have uploaded your 2303 form, JuanTax will send you a notification saying that your 2303 form is either approved/rejected by the system. Check out this article to learn more about verifying your 2303 forms in JuanTax. Aside from two-step authentication, we now have an OTP (One-Time Password) feature which will let you receive a 6-digit pin after entering your username and password. Much like two-step authentication, this feature was designed to add another layer of security to your account. Once you have login to your portal, go to the Account Settings page, and then proceed to the User Settings tab. Enable One-Time Password by turning the switch. After that, you will be redirected to a page where you need to choose which mode you want the 6-digit pin to be sent, either via text or email. Visit this article to learn more about One-Time Passwords in JuanTax. In our latest release, you can now also log into JuanTax just by using your Google account. Just click the Login with Google Link and it will prompt you to a window where you need to enter your email address and password in order to create an account. After that, you will be prompted to the organization portal of your created account. Visit our updated Logging into JuanTax article to learn more about the many ways of accessing your JuanTax account.